Apple, book publishers accused of price collusion on e-books. 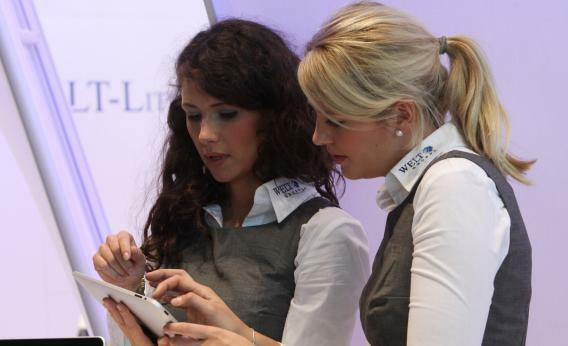 Women use an Apple iPad tablet computer during the Frankfurt Book Fair 2010 on October 6, 2010 in Frankfurt am Main, Germany. E-readers—despite Jonathan Franzen’s aversion—are marvelous: You can carry several books on a plane without taking up valuable carry-on space. You get your books instantly (even impulse purchases made after a couple of glasses of wine, not that I would ever do such a thing). But few readers are happy with e-book prices. Sure, there are bargains to be found. The first installment of The Hunger Games costs just $5.51 in the Kindle Store, making it something of a gateway drug. But when prices for e-books are nearly the same as, or even higher than, hard copies, something feels amiss. Given that it’s still a bit of a chore to get e-books through public libraries, depending on your location and your particular flavor of e-reader, the high prices likely keep many people from taking the digital-book plunge. [T]he anti-trust investigation is about the publishers’ decision to switch to “agency pricing” in which they set the price and allow retailers like Apple, Amazon and Barnes & Nobel to take a commission. Prior to this system, the industry was using a wholesale model in which the publishers sold to the retailers which in turn sold the e-books at whatever price they liked. In practice, this meant that Amazon was often selling books at a loss to build market share (and, in the publishers’ eyes, teaching consumers to get accustomed to unrealistically low prices). A settlement between the government and the publishers—which is the most probable outcome—will likely include provisions that restrict agency pricing and permit retailers to engage in more discounting. Should this happen, the publishers involved will likely be furious. But Amazon—which fought the “agency pricing” system—and e-book readers will benefit. Read more on the Wall Street Journal and Paid Content.